Full Lug Style Butterfly Valves from Robert-James Sales, Inc.
An economic, general purpose, full performance butterfly valve, bubble tight rated at 200 PSI-WOG that meets the stringent demands of the processing industries as well as the needs of the mechanical contractor in HVAC applications. Designed for ANSI 125/150 lb. 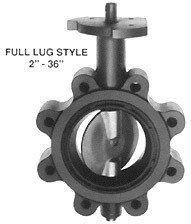 class flanges, these valves oomply with MSS-SP-25, MSS-SP-67 and API-609 specifications. Cast in-place mounting flange accommodates all types of operators: manual handles and gear operators; pneumatic hydraulic, diaphragm and electric actuators. Each valve hydrostatically tested on both sides to 225 PSI. Dual stem seal is between disc and seat spherical hubs (Patent 356394). additional seal from seal O-ring. Oil impregnated bronze bushings provide maximum stem support while accepting side loading to minimize torque for peak operator performance. Two piece blowout proof stem design allows field replacement of seats. All lug bodies are threaded. Drilled holes are optional. 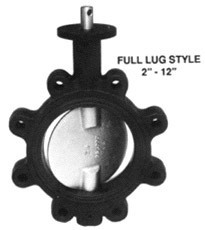 2" - 12" full lug style Model 56 suitable for dead end service (up to 200 PSI) without a downstream flange Sizes 14" and larger require a downstream flange.